My previous experience of football outside the UK has been quite grand. While on my travels I have watched Inter vs. Helsingborg FF at the San Siro in 2000, and FC Barcelona vs. Club Brugge at the Nou Camp in 2003 (both Champions League). In the last fortnight, I have added Kalmar FF vs. GIF Sundsvall at Fredriksskans IP in the Allsvenskan (Swedish 1st Division) and AIK vs. IFK Norrk√∂ping at the R√?sunda Stadion in the Superettan (Swedish 2nd Division). But there’s something a bit odd about Swedish league football! Aside from football being played during the summer (for climatic reasons – January in Sundsvall would not be fun), the main oddity of the Swedish football league seems to be that half the teams are in the wrong divisions! While Kalmar’s home ground, beside the water and with the willow trees blowing in the breeze is very pleasant, there is not even the feeling of a real football tradition. It has a 9,000 capacity. The line of bicycles lined up outside the ground just feels rather quaint! 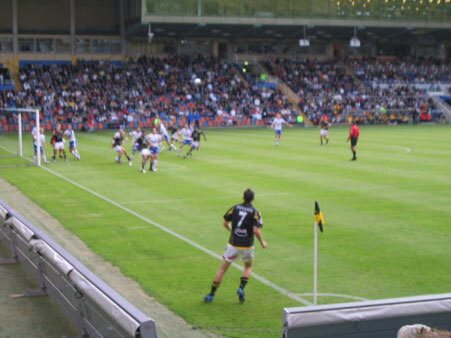 The quality of the football was not great – a dull 0-0 against Sundsvall, who had managed to send about 30 fans to this away tie. Further, the ground really lacked atmosphere – Helena and I managed to get some chanting going ourselves – that’s how low key the support was. Going to the R√?sunda to watch AIK was a different matter entirely. 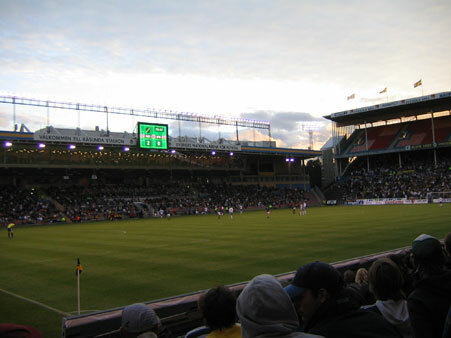 18,810 people were there – a new record for the Superettan – and there was quite a buzz in the stadium. Even the hot-dog sellers seemed to be doing good business. IFK had sent a decent allocation of travelling fans – the ‘Peking Fanz’ (no idea why they are called that) – and from the start the match was swifter, more passionate, and generally better. The ‘Black Army’ of the AIK supporters were even passionate enough for a small fight to break out in the devotees’ end of the ground. Star of the match was Ghanian international Derek Boateng who is apparently interesting some UK Premiership teams at the moment. It’s very clear to see why – his sharp but simple touches in central midfield, plus a delightful volley to score the first goal mean he is surely too good for the Swedish 2nd division. AIK are now top of the table and should be odds-on for promotion. The oddity is how they, and even IFK, are in the league below Kalmar and Sundsvall! So Fram√?t stolta AIK and I look forward to a title challenge in the Allsvenskan next season! I am British… But my girlfriend is Swedish and lives in Sweden, so I am there quite often. Further, from the fortunes of AIK to lingon berries and the future of the Swedish social model, I am quite fascinated by the place and hence write quite a lot about it!